Dice Tower is an iPhone/iPod touch puzzler that’s as simple to pick up as its name suggests. You build a tower of dice with added scoring rules that provide more challenge. Your objective is twofold: build the highest tower you can with a given number of rolls, and score as many points as possible. Both of these missions are challenging, and the game would work with just one of them, so it’s interesting to balance the two. 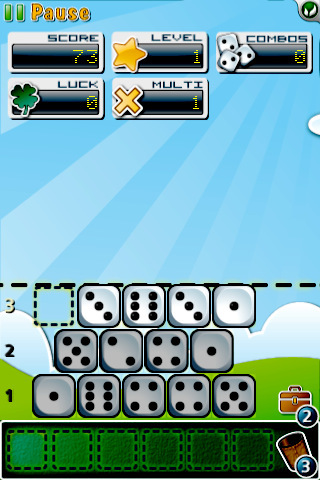 You are given six dice in a roll, and must stack them one row, or floor, at a time. The floors are staggered between rows of five and four dice. The face on each die must equal the sum or difference of the two dice directly underneath it; if the two dice on the lower floor are identical, the die you play must be the same value. There are occasional surprises in Dice Tower, both helpful and harmful, that may come up in a roll. These include: an extra roll, a blank-faced “joker” die, a bomb that explodes all the dice in your hand, or a random amount of bonus points added to your score. The tradeoff is that every special die you get in a roll means one less numbered die in your playable hand. Points are based on the value of the dice you place on each floor. 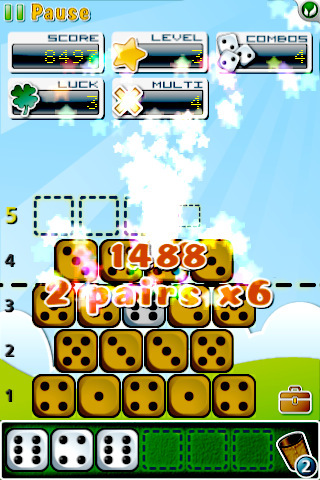 Multipliers can appear in random spaces, and achieving poker-style combos on a floor can multiply that floor’s score. Playing to maximize your score is not necessarily the best strategy, however. For instance, placing all fives on one floor will earn a high score for the floor, but will ensure that you can place only fives on the next floor, and every floor after that. I usually ignore the combos and multipliers, instead arranging my dice in an attempt to maximize my chances to play any given value on the next floor. With a limited number of rolls, you want to be able to play everything you can. The good news is you can save dice in a chest, planning for future floors. An experienced player will be able to successfully balance strategy and scoring. The app’s visual and sound effects are a little jarring for my taste. Loud chimes and bleeps punctuate nearly every move. Earning combos gives you showers of exploding stars and an excited scream; running out of moves results in a sad trombone wah-waah sound. If you earn a multiplier and it expires, it will beep menacingly during its last few seconds, more of a distraction than a motivation. Fortunately, you can turn the sound effects off. All in all, I enjoy the simple game at the heart of Dice Tower. I’m not sure if the additional scoring rules are necessary, but other players may enjoy the added challenge and strategy. In a way, it can be as easy or as difficult as the player wants. AppSafari review of Dice Tower was written by Katherine Thorne on April 12th, 2011 and categorized under App Store, Games, Puzzler. Page viewed 3405 times, 1 so far today. Need help on using these apps? Please read the Help Page.